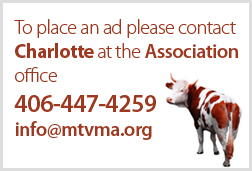 MVMA Members - including student members - may post requests on this page at no charge by emailing Charlotte the posting: [email protected]. The posting will remain up for 3 months. Please click here for non-member pricing. Maine vet planning to visit Montana (camping in small AS trailer) for May of 2019. I hope to do some fly fishing and visit a practice that works with sheep. At the farm (soon to have a small flock of sheep) there is a camp site with hook ups and an empty apartment. All the best, John Flood.